I love chocolate! I may or may not have an addiction. I saw this recipe from Eat Cake For Dinner and had to give it a try. It was AMAZING! 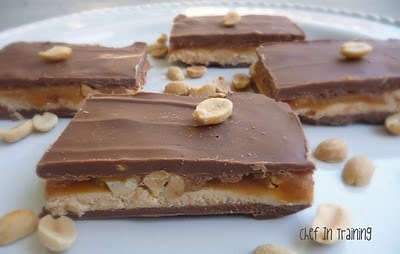 It tasted just like a real Snickers candy bar!..only better because it was homemade! Melt together all ingredients in the microwave, stirring every 30 seconds until melted. Spread into a lightly greased 9×13 inch glass pan. Put in fridge to cool. Melt butter in saucepan over medium heat, add sugar and milk, stirring constantly to dissolve the sugar. Bring to a boil and stir for 3-5 minutes. Mixture will start to follow your spoon. Remove from stove and stir in marshmallow cream, peanut butter and vanilla. Mix until smooth. Spread over first layer and sprinkle peanuts over top. Unwrap and melt the caramels with the cream in the microwave, stirring every 30 seconds until melted. Carefully spread over filling layer. Melt together in microwave, stirring every 30 seconds until melted. Spread evenly over caramel layer. Store in the refrigerator until cooled and hardened. Cut into small bars. Keep refrigerated. Both my husband and I love snickers, I'm saving this recipe thanks!! I pinned this awhile ago, but was a little confused by the butterscotch chips. But if you say it tastes the same I'll have to give it a shot I guess! These look so much better than the real snickers! Yum! That looks SO good! I have to give it a try. YUM!!!! These look soooo good. I have a recipe that mixes chocolate chips, butterscotch chips and PB too and the affect is wonderful. These look amazing! I will have to try sometime! Thanks! Thanks for sharing this! Looks delish! My kiddos would love me so much more if I made these..lol.